Two weeks ago, Tyler won us our first family pet. We’ve had a few creatures try to be our pets (namely the neighbor’s cat and the ants that congregate around Lily’s high chair), but none have officially been our pet. That’s Dorothy. Yes, the same name as Elmo’s goldfish. However, this one isn’t pronounced in the traditional sense… The boys say it like they’re lobstermen in Maine! Comes out more like Daaawthy. Cracks us up! So how did Daaawthy come to join our happy, crazy home? Ty won her (him?) at an over-priced, traveling carnival. I think the teenage girl running the game we were at thought triplets were cool, cause she totally “helped” Ty win. There was no way he was going to successfully get one of his 12 ping pong balls into one of the tiny goldfish bowls 4 feet away. So she cupped her hands around the opening of one of the bowls and told him to aim for that one. When the ball landed on her arms she let it slide down into the bowl. 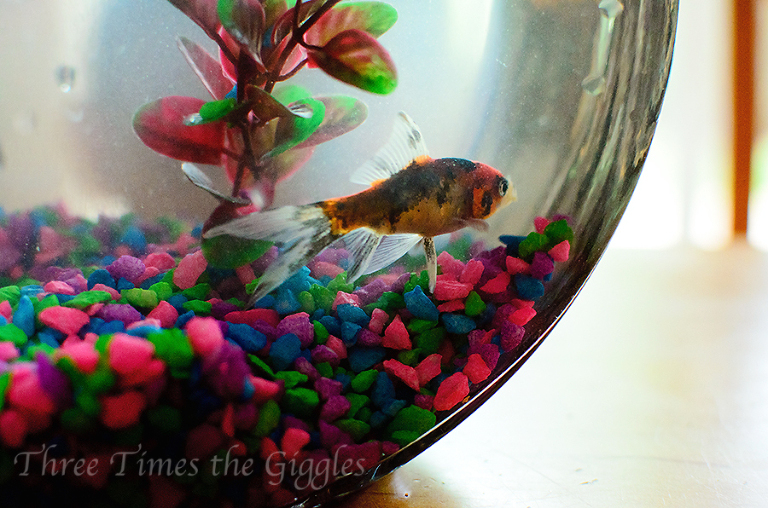 Honestly, it’s a miracle the fish has survived two weeks in our house. She doesn’t get fed more than once a day usually, because she’s in the boys’ room and we forget about her until they’re getting ready for bed at night. The other day I noticed she was getting harder to see through the gross water, so finally got around to changing it.